Disney World was amazing--a-maze-ing. But it is NOT my favorite park in Orlando. That honor goes to the Wizarding World of Harry Potter inside Universal's Islands of Adventures. 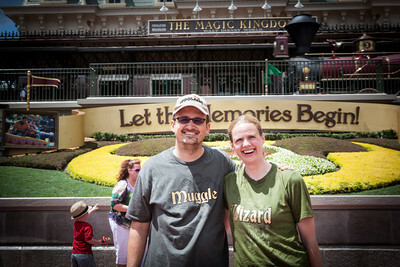 I consider the mere 5 hours I spent at Wizarding World to be the happiest commercial time of my life. And the rest of the day wasn't too shabby either--Seuss, the Hulk Coaster, river rafts, playgrounds, and a little shopping. Universal has all the magic of Disney (one of only a few theme parks that can make that claim). And frankly, Harry Potter World is so engrossing it outstrips Disney--which I didn't believe was possible. The attention to detail is amazing from the Hogwarts train, to Moaning Mrytle in the bathroom, to the window displays, to every flavor bean, to room after room in the castle. From the moment we stepped into Suess Island on our way to Potter and through the rest of the park, I was continually immersed into the experience each island offers (with 4 boys, superhero and dinosaur islands were also impressive). Another big advantage is Universal's appeal to families with a wider range of ages. With larger coasters and more intense rides for older kids (like Spiderman), to several deluxe playgrounds and Seuss Island for little ones (and most toddlers prefer playgrounds to rides anyway), your entire family can be happily entertained (a major complaint of Disney World is teens are bored at the Magic Kingdom and younger children are uninterested in Epcot and few families feel good about the money they spent to see Animal Kingdom). Another advantage of Universal is the pricing--not only are park tickets cheaper, but so are meals. Whether you want an all day meal pass (not valid at Harry Potter), or just want to dine where you like, meal prices are often cheaper and kids meals are much cheaper compared to Disney (though portion sizes may also be smaller). On the other hand, Universal is not know for fine dining (outside of Mythos) and Harry Potter treats including chocolate frogs, butterbeer, and pumpkin juice are expensive necessities. All in all, we spent the same at both parks but only because we heavily indulged in Potter foods including several candy items we took home. Fortunately, we learned how to make butterbeer at home. I also enjoyed the shopping along CityWalk which remarkably resembles California's Downtown Disney (a more intimate shopping experience than the Orlando equivalent). Open later than the park, it offers all the shopping with plenty of specialty stores including Potter merchandise without the hassle of carrying your purchases through the park. It also is a manageable size so you can shop as part of your day. For those who want to shop within the park, there are plenty of specialty shops. I wanted to frame my credit card bill after vacation because it listed such shops as Honeydukes, Filch's Emporium, Zonko's Joke Shop, and Cats, Hats, & Things. My biggest complaints was the lack of a free fastpass system. Unless you stay at their resort, fastpass costs the same as the park ticket (making it much cheaper to stay on-site). After much debate, we decided this was not an option for our family and had to plan our day around the lines. One of the obvious problems with this is that the water raft rides (there are 3 of them) are best in the middle of the afternoon, when you want to get wet and take a break from the heat. That is also when those lines are longest. Other lines were relatively long throughout the day including most of Seuss World and the Pteranodon Flyers, though we generally waited less than 30 minutes for most attractions. And though this should be obvious, for those who are not familiar with the characters/movies/books/comics that inspire the islands, this theme park will not be very magical. So those who have never read a Harry Potter book or watched a Marvel superhero movie, this may not be your thing. And though my husband has watched all the Potter movies, he spent his time entertaining our toddler by the talking fountain in Lost Continent and in Seuss Island because he did not want to spend more than an hour in the somewhat claustrophobic Potter World (the poor muggle). This park was so amazing that I have a top 10 list for the entire park as well as a top 10 list just for Harry Potter. And as my younger children grow and begin to read the Potter series, I have a feeling, we will plan another visit to this incredible place.